NEW YORK, April 10, 2015 – It’s an age-old dilemma faced by young and old, in homes large and small, in the city and in the country: How can two adults happily share one bathroom? 1. Do you have specific wishes for the décor: different color scheme, materials, flooring or lighting? 2. What amenities would be ideal in the bathroom? Perhaps a radio or television, chromatherapy, heated towel racks or flooring, candles or plants. 3. What type of sink and storage is needed? 4. What size and type of faucet is ideal? 5. What about the shower head? Is a head or hand shower preferred? 6. Is a tub crucial? Floor warming mats and towel racks will make a big difference in a cold climate. “Someone who has never had such luxuries will wonder how they ever lived without them after a few days.” The same holds for quality towels. The higher the thread count, the more absorbent. For news junkies, a radio or television makes sense, and for the aesthetically oriented, a lovely bureau to hold bath, beauty and cleaning supplies with a vase of flowers on top would make them happy. Wireless technology. Push-button operation. Experience the convenience of digital technology with GROHE Veris F-digital. What is the closest thing to separate baths? “His-and-her sinks,” replies Dixon. Two installed in one vanity, or affixed to opposite walls, it doesn’t matter, whichever works best with the room’s layout. Two sinks are great for a couple who share different philosophies about what stays on the sink rim and what gets put away, as well as those following similar time schedules. Convenient and intuitive to use, Allure F-digital by GROHE takes the faucet design in a new direction. 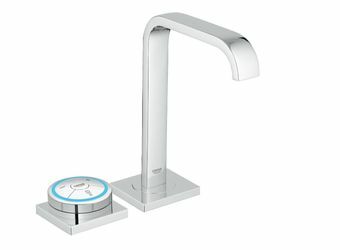 GROHE’s F-Digital series offers the ultimate in personalization. Small digital controllers can be placed anywhere in the bathroom, offering freedom of design. Precise control, the perfect temperature and the luxury of saving preferred settings with a single touch make this red dot award-winner the ultimate must-have for an amazing bathroom. 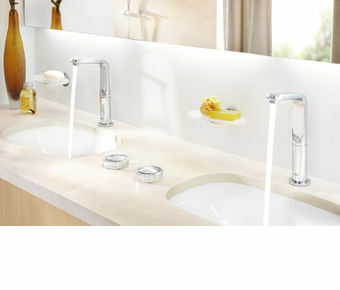 The Euphoria System by GROHE is a combination of modern, contemporary design and functional excellence. For those who prefer showers to baths, the Euphoria System has it all, including a thermostat and shower head as well as hand shower so the choice is yours, either overhead spray or positioned to your preference. Beautifully proportioned, finished in StarLight® chrome for long-lasting luster, it nearly passes as art, definitely as eye candy. 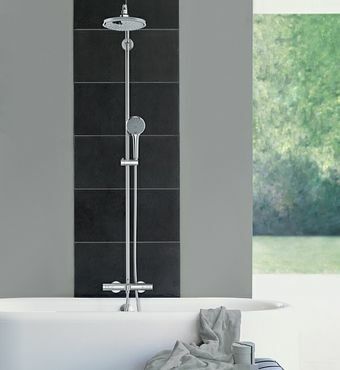 Wonderful on several other levels – its ergonomic design means comfort, water consumption can be reduced up to 20 percent with a special eco function that’s offered and the CoolTouch® system ensures the handle never becomes too hot to hold Euphoria is especially practical for two people sharing one bathroom, as each can put the shower head at their favorite angle quickly and easily. The Euphoria Massage shower head offers three spray settings, rain, massage and eco. What a good way to reward yourselves after fixing up the bathroom.